Fareham Creek is a first opinion small animal practice which is fully equipped to investigate and treat the vast majority of medical and surgical cases that come into the practice. Our appointment book is computerised which allows us to efficiently make appointments for you and your pet. Our receptionists and team will attempt to accommodate all requests to the best of our ability. 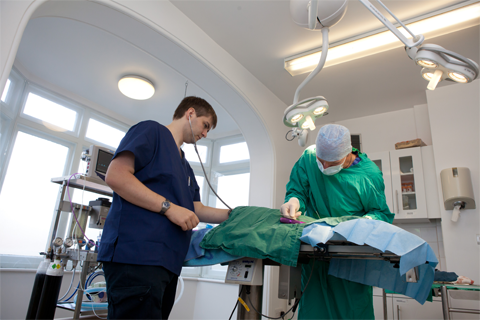 Routine Consultations and Health Checks, Vaccinations, Microchipping and Pet Passports – We have three Veterinary Surgeons available for consultations throughout the day. House Visits - Whilst for most situations the best facilities for the examination and treatment of your pet are at the surgery, we are very aware there are circumstances where you might want us to visit you at your home and we will, wherever possible, try to accommodate you. If you would like a house visit please call early in the day so that we can plan ahead and find a mutually convenient time. Please be aware that owing to the extra time involved with house visits the cost will be higher than if you are seen at the surgery. We are always happy to provide an estimate upon request. Nurse Clinics – Our qualified veterinary nurses are able to offer nurse clinics which are designed as an adjunct to the care or advice that has been provided by the vet. Our nurses are unable to diagnose and treat medical conditions so if your pet is unwell it is best to make an appointment to see a vet in the first instance. Hospitalisation – The practice has range of different sized cat and dog cages and kennels for hospitalising patients that are unwell or recovering from surgical procedures. We also have isolation cages well away from the main ward to hospitalise patients with infectious conditions. Operating theatre – The practice has a dedicated operating theatre for sterile surgical procedures. Theatre has a heated operating table and modern LED theatre light and we are equipped to perform a wide range of soft tissue and orthopaedic surgical conditions. Dentistry – Dental procedures are performed in the Prep room. We have a compressed air dental machine that has a drill, ultrasonic scaler and polisher and have very high quality digital dental radiography to help us with our treatment and management of dental conditions. Laboratory – Our laboratory is located in the prep room. We have an in house blood machine that enables us to test Haematology (Blood cells) and Biochemistry (Blood chemistry) quickly and accurately. 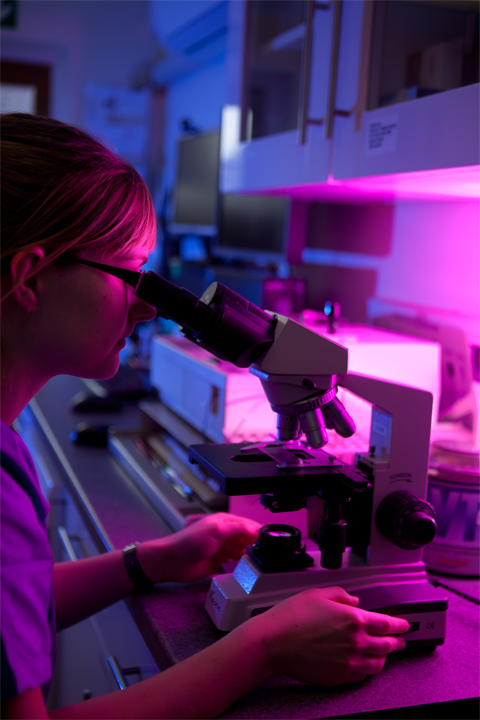 We have a microscope and other Lab equipment to test urine, skin and cytology (cell tests) on site. We also use an external Laboratory to send all range of diagnostic samples. These samples are sent by courier on the day they are collected and most results are available by within 24 hours. ECG – An ECG or electrocardiogram is a machine that tests the electrical conduction of the heart. We use the ECG to help diagnose heart conditions. Radiography – Radiography or x-ray is one of the most important pieces of equipment in the practice and is used to investigate a whole range of different conditions in various parts of the body. We have digital x-ray at Fareham Creek. Ultrasound – Ultrasound is used particularly for conditions of the chest and abdomen and is sometimes used in addition to X-rays to give us more information in particular about the soft tissues of the body. It can also be used to diagnose pregnancy. Rhinoscopy and Endoscopy – Endoscopy involves a camera on either a rigid or flexible tube for examining inside body organs such as the nose, throat, airways or gastrointestinal tract. 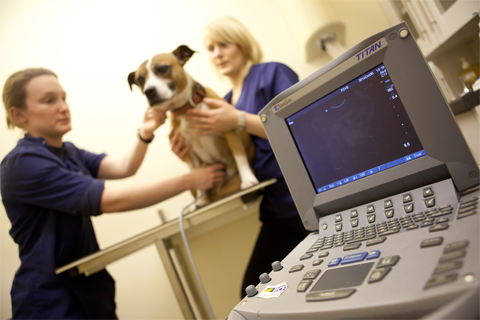 Blood Pressure Testing – Hypertension or high blood pressure can also affect our pets just as it can us. It can cause a range of symptoms, some of which can be very serious if left undiagnosed. We will sometimes need to check the blood pressure of cats and dogs if they are unwell or have renal or thyroid disease. Referral – Fareham Creek is a very well equipped first opinion practice and the vast majority of cases that we see are investigated and treated at the practice. On occasion however we do need to seek advice for difficult medical or surgical cases by contacting a specialist in a particular field and this may result in your pet being referred to a specialist for treatment. We make use of a number of very high quality multi-disciplinary referral practices within a relatively short distance of Fareham.